Ball Tattoo ID being filed 50 strokes by a steel file! Ball Tattoo comes in a kit with everything you need to ID several balls. It includes: Ball Tattoo ink, complete set of 1 inch tall stencils, applicator and instructions. 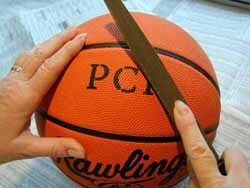 It will work perfectly on all athletic balls, such as basketballs, footballs, soccer balls and volleyballs. It works on all ball materials: rubber, leather and synthetics. See..
Ball Tattoo is the revolutionary permanent ID for balls. It will let YOU protect your balls from loss and theft because your name will never wear off. It won't even file off most balls! 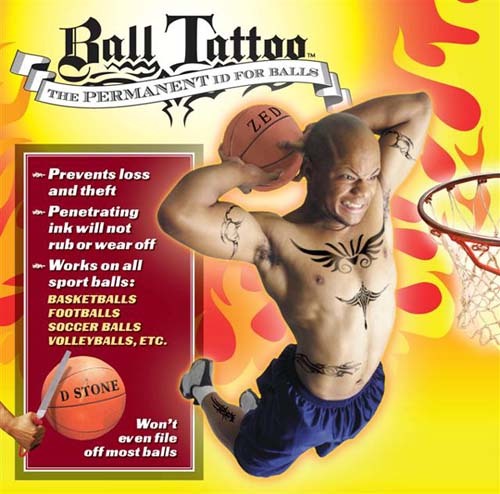 The secret is in the patented Ball Tattoo ink that penetrates below the ball's surface. You will not believe how easy it is to use or how cool and perfect your name wiill look on your balls. So now you can say "good bye" to felt tip markers. Goes on in seconds. Engineered to stay on forever! A name won't wear off, rub off or even file off most balls!